An idyllically located tipi with wood-burning stove and outdoor bath offering a natural-world escape deep in Wales’ Dyfi forest. 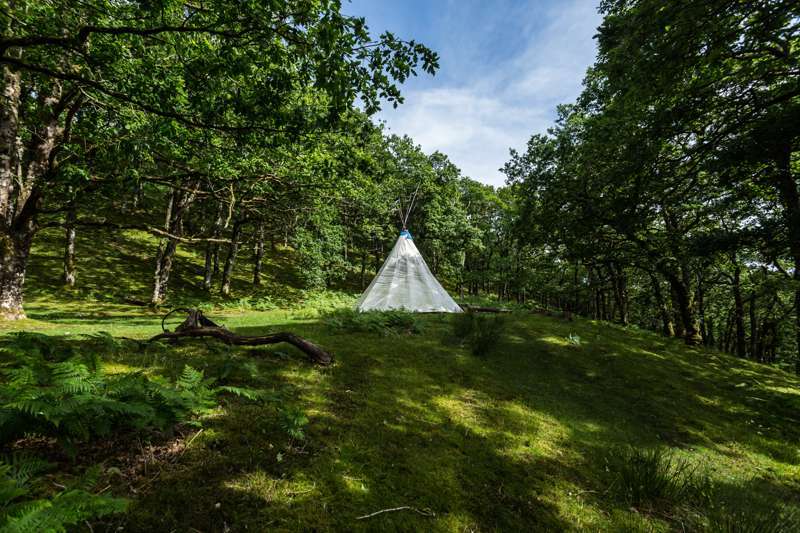 The Forest tipi is in our most secluded spot, surrounded by lovely ancient oak woods. It does involve a walk up a steep slope to get there (please contact us if you are unsure about this) - but you can be sure of feeling totally removed from everyday life and worries once you arrive! Outside you have your own private wood-fired outdoor bath so you can enjoy a hot soak in the open air! and an outdoor fire and seating area - the stars are breathtaking, away from the light pollution of the city. There's also a private shower and eco-loo unit, with water from a spring up the hill. Inside, there's a double futon with comfy mattress, organic bed linen, cushions, a coffee table, sheepskin rugs, a hand-crafted wood burning stove (all wood and kindling provided), lanterns and a gas stove. Cutlery, crockery and utensils are all provided for cooking.